a prestigious wine competition, member of the VINOFED*, organized during the Vinexpo exhibition and under the high patronage of the OIV ! *VINOFED : association of the main international contests of the world gathering together only 17 competitions, among them Citadelles du Vin. 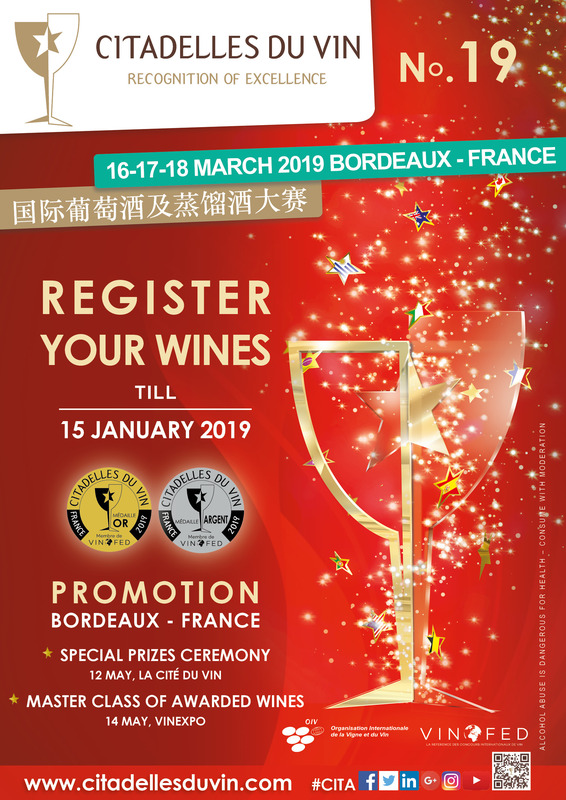 Every year, in March, over 50 top level tasters from all over the world meet in Bourg (Bordeaux-France) for several days to elect the best wines out of over 1,000 samples coming from about 40 countries. With more than 75% of foreign wines, Citadelles du Vin competition is one of the most prestigious global competitions and embodies a true flagship for wine industry worldwide. In 2019, the Award-Giving Ceremony will take place at the Cité du Vin of Bordeaux on Sunday 12th May. The promotion of the laureates will be undertaken all along the very influential international wine and spirit exhibition : Vinexpo Bordeaux from 13 to 16 of May as well as during an Awarded Wines Master Class organised on Tuesday 14 May at Vinexpo-Academy. Find out now more about the next edition! Download the 2019 Order Form. Look at the photo gallery !